Throughout the 1990s and up until I retired as a high school English teacher in 2015 I taught a unit about the Vietnam War. It started with teaching Walter Dean Myers novel Fallen Angels which he based on his brother's Vietnam war experience. the effects of war and how they dealt with surviving. The apex of this unit came when Jan Scuggs, the founder of the Vietnam Wall offered fellowships for teachers of Vietnam to come to D. C. and take part in Vietnam Memorial Teachers Teach Vietnam where we met other educators some of whom were veterans of Vietnam, we exchanged teaching materials and ideas and community outreach, we had the opportunity to meet with our congressmen and senators, some one-on-one to discuss any issue we wanted. We meet with Joe Galloway the co-writer of We Were Soldiers Once and Young. He liked us so much he drank with out group. We had a remarkable ceremony at the Wall where each of the 50 teachers honored a person whose name was on the Wall. One of the participants honored loved ones or friends. I honored the only man for Columbia High School who died in Vietnam. It was truly an memorable time for all of us. The group watched a new documentary about a daughter's search for her Vietnam casualty father' memory. The film Be Good, Smile Pretty was about Lt. Dross from MO. 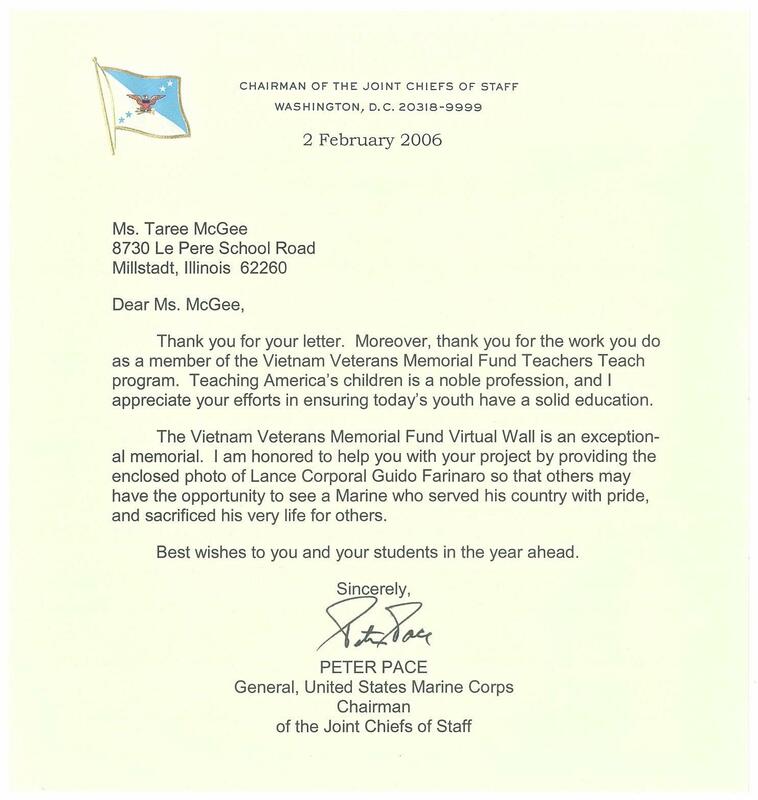 My outreach program I brought back to two of the high schools where I taught was to have my students contact local veterans organizations and area families who lost someone in Vietnam and post their information and photos on the virtual Wall. One notable person was the first casualty of Gen. Peter Pace who was one of the Joint Chiefs of Staff lost in his unit. Years after, I got notes and emails from students who were educated and touched deeply by this touch of an American conflict.